Fall is in full swing what better time to talk pumpkins. We have rounded up a few colorful and fun ways to incorporate pumpkins into your classroom this fall. Check out a few of our favorite ideas below. To see more be sure to follow us on Pinterest. Growing Pumpkin seeds in a pumpkin, great way to learn about plants and what plants need. You can also incorporate a quick lesson on where we get our food from from farm to the table and everywhere in between. Have students make their own healthy pumpkin snack using celery and a clementine orange....yum! Pumpkin printing with pool noodles, great for an independent art center or for little hands just learning to paint. Who doesn't love a little glitter??? Well custodians probably...but little ones love it. Use a glue water mixture to cover a small pumpkin, have students sprinkle on their favorite color of glitter. 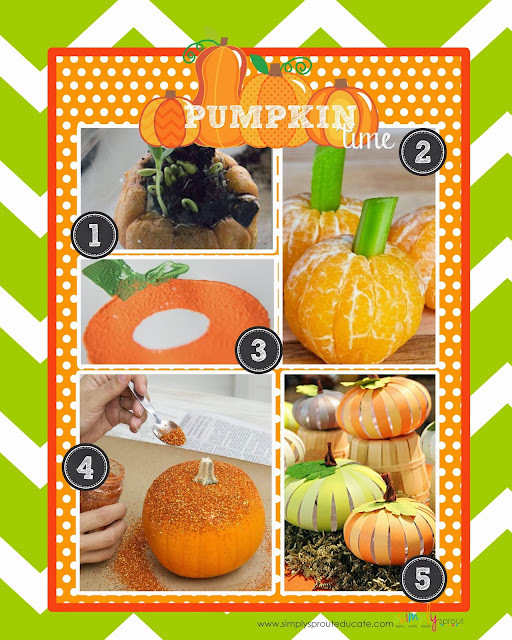 Use paper strips to make these adorable pumpkins, great for a 3D bulletin board display. 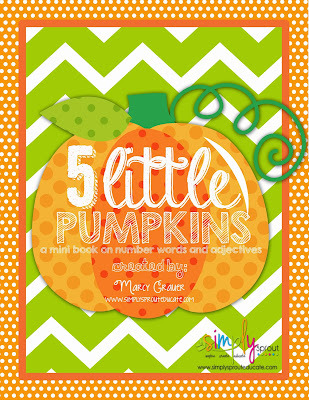 If you are looking for a little Halloween fun for reading check out our 5 little Pumpkins mini book. Review basic sights words, adjectives and number words with this cute holiday themed mini book. Ideal for small reading groups.